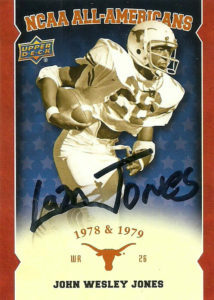 An impressive track man with fleet caliber speed, Johnny ‘Lam’ Jones was a deep bomb threat at the University of Texas from 1976-1979. 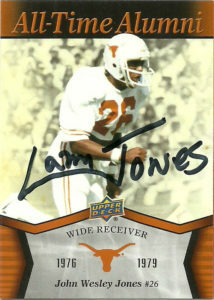 Originally a runningback, Lam was switched to receiver in 1977 when coaches were blown away by his speed. Case in point, Jones was part of a 4×100 relay team for the United States, that won gold in Montreal in 1976. In 1977 he demonstrated his speed recording 21 catches for 543 yards, a whopping 25.9 yards per grab, and 7 TDs. He finished his career at UT with 156 carries for 850 yards and 6 TDs, to go along with 85 receptions for 1603 yards and 14 TDs. 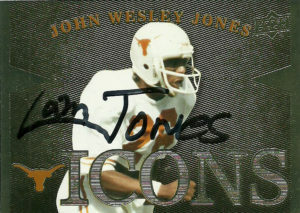 Jones was also a capable kick returner with 28 kick returns for 589 yards and a TD. 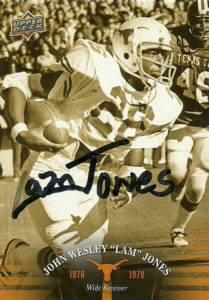 The New York Jets were enamored with Jones’ speed and big play ability, and traded up in the 1980 draft to the #2 overall spot to grab him. It was a stiff price to pay, and while Lam averaged a healthy 16.8 yards per grab over his career, the price tag was too much for NY to bear. John’s best season came in 1983 when he caught 43 balls for 734 yards and 4 TDs. His career was defined by trauma, as in 4 consecutive seasons it was ended by some sort of malaise. He’d be cut in 1986 and retire. Jones descended into darkness. Drug and alcohol abuse, and bad decisions really impacted his life. It took many years for Lam to climb out. Lam found focus in his life and dedicated himself to helping others avoid the same problems he encountered through public speaking. John was really nice to fans at the Collectible Show in Waco. He and I talked at lengths about how Austin and I-35 had changed. While he discussed with me his Myeloma Cancer and the fact that his doctor told him in 2005 he’d be dead in a year in a half- indeed the cancer has returned and he is no longer in remission. He really liked the icons card that I had of his, and I agreed to send him one to keep. I don’t mind long drives for autographs. In fact this one seemed close enough at a click over 100 miles. The drives are always purifying to me- something that clears my mind, with a reward pegged at the end. This drive was particularly interesting as it took me an alternative route from Bastrop to Temple and through places like Bartlett and Little River. It was a bit off the beaten path, but I felt like my own explorer in a strange land. I had never been to the Texas Sports Hall of Fame where this signing was at, but it was woefully short on Houston Oilers history, and long enough to display memorabilia from KS Bud Adams. It’s worth a look see at least once for fans and casuals alike. UPDATE: 3/15/19 Johnny Lam Jones passed away Friday morning from Cancer. He was 60 years old.